Rhubarb is technically a herb and dates back hundreds of years in the UK. It is easy to grow and produces delicate, sweet stems that can be steamed or blanched and eaten with yoghurt or cereal, or made into a delicious rhubarb crumble. Rhubarb is winter hardy and grows from crowns. Each plant can live for up to 15 years, but a patch of rhubarb will regenerate at the crowns and provide you with decades of continual cropping throughout the summer months. Once the crowns have produced stems they lie dormant throughout the winter, but the cold weather stimulates them to grow again the following spring. The shoots first appear in mid-late spring, as tiny bunched up leaves on a small stem. These then grow into long stems, which are ready to harvest when they are about 50cm-1m in length. Rhubarb is tolerant of most soils, but does well in fertile, well-drained soils that are packed with rich, organic matter. If you are creating a rhubarb patch from scratch, incorporate plenty of organic matter in the form of well-rotted manure or garden compost into the soil before planting. The plants are perennial, so your bed will be a permanent one and so it’s important to get the soil as fertile as you can before you plant. Afterwards you will only be able to top-dress the soil with organic matter unless you completely remove the crowns and re-plant them. 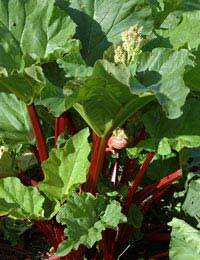 Plant rhubarb crowns in early spring, about 1m apart in rows, or scattered over a wider growing area. Water the crowns well and ensure weeds do not crowd them out. In the early stages of growth, weeds can block light from the crowns and compete for nutrients and water. This can suppress the crowns’ growth. Make sure your crowns are planted in weed-free soil and regularly hoe the soil, or remove annual weeds that germinate. For an extra sweet, juicy crop of stems, place an up-turned plant pot over the crowns as the shoots first begin to grow. As long as the plant pot has a hole in the bottom of it, the crowns will grow upwards to the light. The stems will be a deep pink colour and very delicate. Harvest when they have reached the top of the pot. Whether you are new to growing your own fruit and veg, or you have been growing it for years, rhubarb is a delicious and versatile crop to have in your garden. It is fantastically easy to grow, and can easily be incorporated into breakfasts, lunches and dinners as part of your five a day. We're glad it helped you. I have a pear tree that I want to move when is the best time to do it.